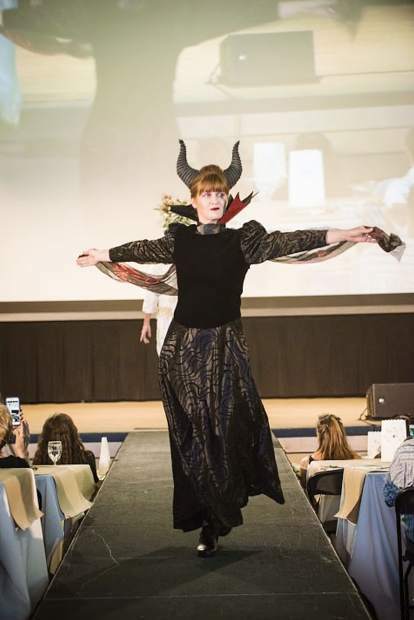 Julie McCluskie comes out as "Maleficent" from the hit Disney movie by the same name Friday during the FIRC Fashion Show. The Family and Intercultural Resource Center’s annual fashion show on Friday was expected to sell out. However, what wasn’t certain is that, in so doing, the show would crush organizers’ goal of raising $130,000. Reporting that the annual quirky fashion show helped bring in $175,000 total, FIRC development director Anita Overmyer added that they had more than 400 people in attendance this year. Billed as one of the most fun fundraisers in Summit County, the high volume of ticket sales reflects how popular the quirky event has become in the last six years. For the show, more than 80 volunteers walked the runway in thrift-store clothing, and the money they raised will go to support FIRC’s many programs, including parenting classes, early childhood education and nutrition, and emergency assistance. Last year alone, FIRC served more than 3,500 residents, Overmyer previously said, and she emphasized the money raised through the annual fashion show is critical for the family-focused organization to continue its work.